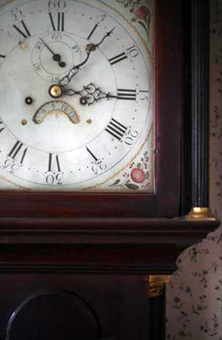 I specialize in buying and selling American antique furniture of the pre-industrial era. I have a small inventory available for viewing by appointment at our farm and welcome your questions and requests. Among those to whom I have sold pieces of furniture are: Israel Sack, Inc., Nathan Liverant and Son, Courcier & Wilkins and the Metropolitan Museum of Art. 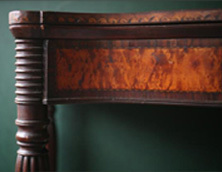 I do conservation and restoration of furniture of all periods with the exception of Oriental furniture. To use a phrase Leigh Keno used on the Antiques Roadshow, I am a “conservative conservator.” I try to do everything possible to maintain the originality of the furniture while also improving its appearance and providing for its continued usefulness. This approach is also more efficient, frequently less expensive and certainly better environmentally than many of the common methods used in this field. For those conservation skills I do not possess, I work with other very talented professionals for such work as gilding, paint restoration, fiber seating, upholstery, etc. I appraise American and British furniture of all periods. I am a restorer and dealer with over 25 years experience. I charge a flat fee based upon the amount of work necessary to accomplish the client’s needs.